Five Falls, one of the popular pilgrimage and bathing sites to the west of the south Indian spa of Courtallam. The falls, located in riparian forest in the relatively dry Tamil Nadu plains, are fed by the South West monsoon as it becomes active on the western coast of India. In June when the South West monsoon moves up the western coast of India, the rugged spinal ridge of the Western Ghats intercepts the rain- laden clouds. The eastern plains remain relatively dry, bathed in warm sunlight with spectacular views of cumulus clouds over the neighboring state of Kerala. In the Ashambu Hills around the sacred peak of Agastyamalai the South West waters the evergreen forests that make this one of the most important biodiverse areas in the country. The monsoon feeds numerous streams and rivers. They cascade down from the evergreen forests though dry deciduous scrub forests into the arid plains that stretch from Kanyakumari northwards through Papanasam and to Srivillaputur and beyond. Several falls have attracted pilgrims and visitors for hundreds of years, something in evidence through the Jain and Hindu inscriptions on the rock sides. Today a visit during the monsoon season is both a pilgrimages as well as a visit to a bustling water theme park where identities of caste and creed are temporarily washed away. 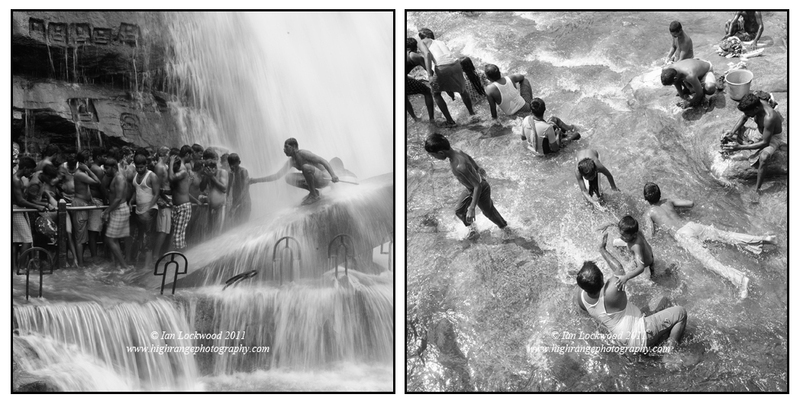 Scenes from Courtallam’s Lower Falls: Crowd control on the men’s side and bathers in the stream. 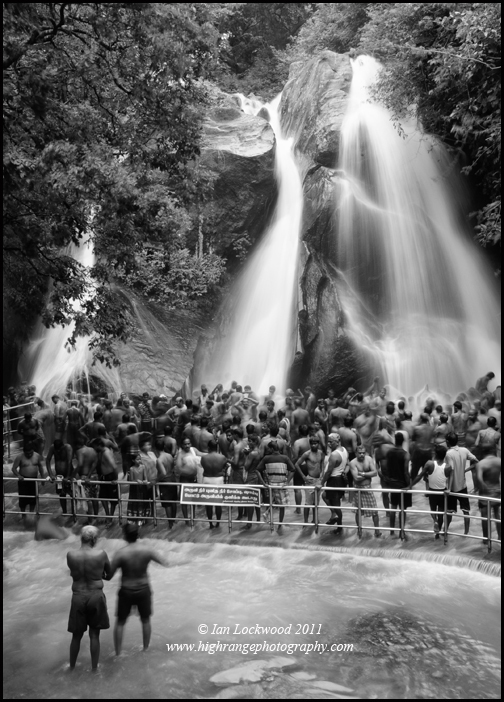 • Courtallam’s Five Falls, men’s side. Courtallam is the most important spa in the area. It is a place I have visited over the last 20 years and that provided inspiration for photographs that attempted to bridge the ecology and human interaction of the area. There are several falls here and it is awash with tourists from Tamil Nadu and some of the neighboring states. It still remains off the radar screens of most Lonely Planet wielding tourists and thus offers an intriguing glimpse into southern traditions. Unfortunately the pressure of the masses is hard to miss and one must put up with serious rubbish and trashy streams in these areas. Bonnet macaques terrorize anyone with food. There is a permanent police presence helping to sort people out (males in one set of falls women in another) and keep giddy young men in line. 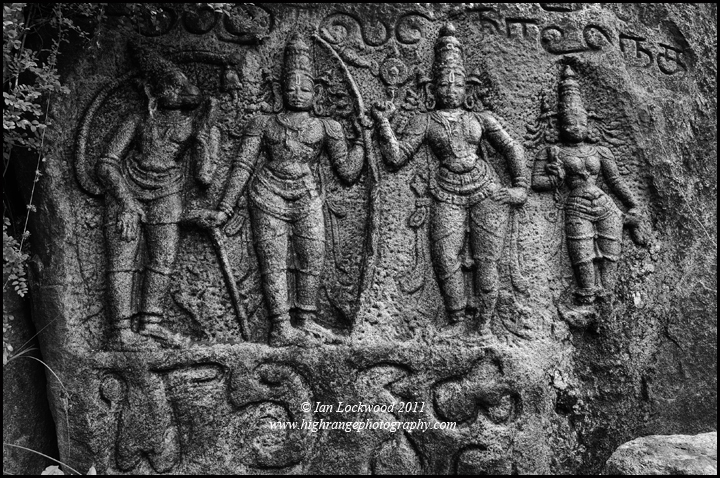 Relief carving of Hanuman, Rama, Laxman and Sita near Agastyar Falls. 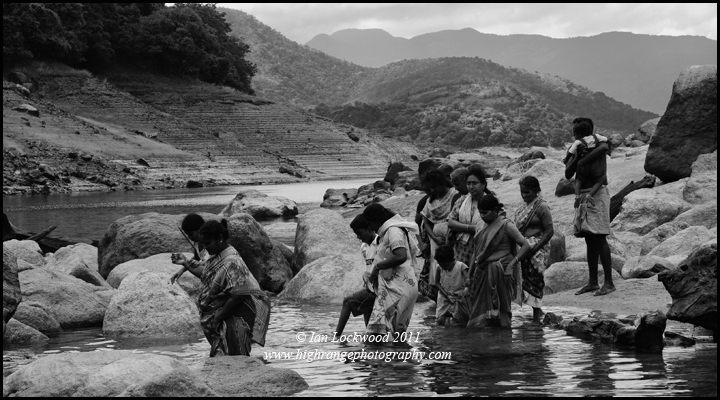 Pilgrims and bathers at Nambi Kovil (left), and the Agastyar Falls area (center and right). Further south near Papanasam, where the sacred Tambraparani river meets the plains from the Kalakad Mundanthruai Tiger Reserve (KMTR), there are a series of falls. Notable is the Agastyar Falls, named for the peak that gives birth to its waters on the high and remote border with Kerala. This was once a roaring falls that has now been harnessed in a hydroelectric plant and thus reduced to a trickle. Thomas and William Daniel painted the falls in the late 18th Century. 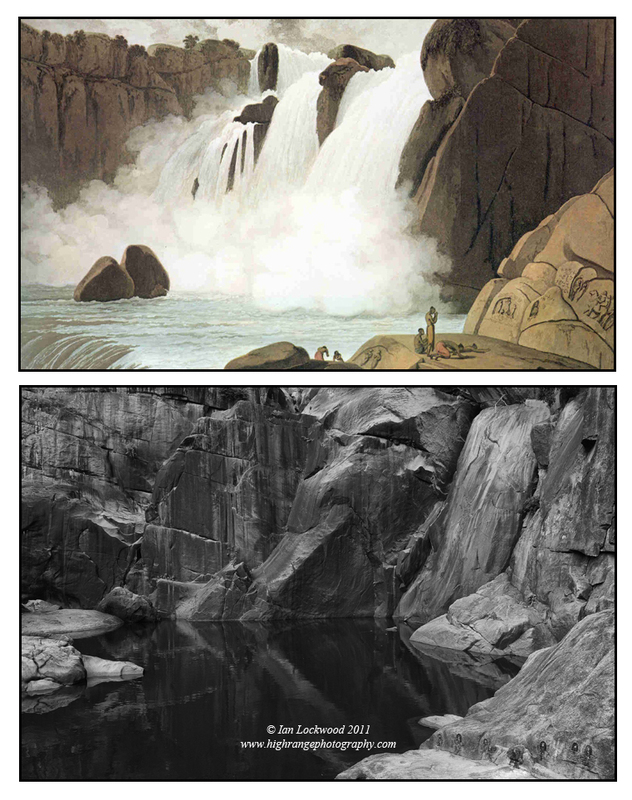 There dramatic aquatint of the falls was part of the Oriental Scenery collection. It is now an ideal location to take children rock hoping and exploring, which is exactly what Lenny, Amy and I did on our visit in June. We clambered over boulders and across dried rock faces to the base of the falls and looked for evidence of rock carvings that are visible in the Daniells’ painting. Sure enough they are there at the base of a small Vishnavite temple. Nearby a stunning panel of Rama carves Hanuman, Lakshman and Sita is carved into the granite side of the slope. Karaiyar reservoir with boats making their way across to Banerthetum falls. The surrounding catchment area is carpeted under impressive stands of evergreen forests that are part of KMTR’s core zone. Balancing the growing numbers of pilgrims with the need to protect this incredible area remains an ongoing challenge for the Forest Department and conservationists. Following the stream upwards once eventually get to the enormous Karaiyar reservoir, a man made lake that is surrounded by some of the most stunning scenery in the Western Ghats. Here motorized launches take pilgrims and bathers across the lake to Banerthetum Falls. It’s a bit of a circus as one clambers out of the boat on to the sandy shores, crossing a deep stream to makes one’s way up to the falls. The pilgrims are friendly and are curious about what I am doing there on my own with two kids and a backpack full of camera gear. A sign reminds visitors that they are in a Project Tiger area. At the top of the first falls and below the higher falls we join a throng under the pounding water of the Tambraparani. Pilgrims negotiating a minor river before clambering up to Banerthetum Falls. 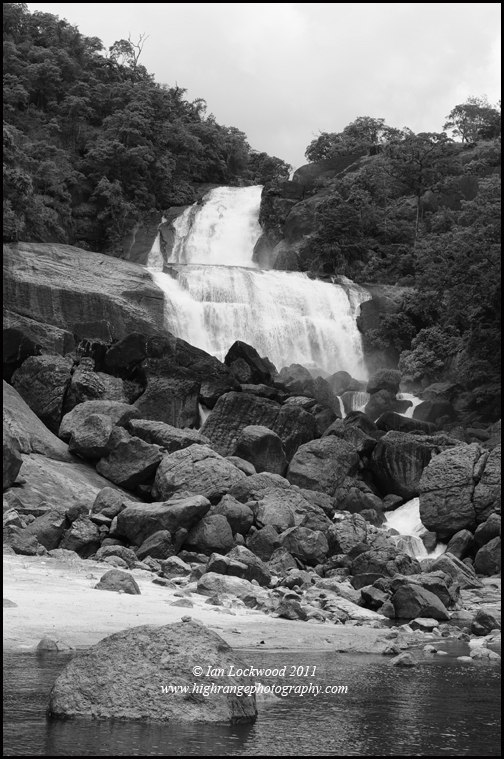 Banerthetum Falls with the sacred Tambraparani River gushing with the waters of the South West monsoon. Further south we spent several restful days with our friends at the Dhonavur Fellowship. I appreciate the efforts of ATREE to document the area in their very useful guide Treasures on Tiger Tracks. Their field staff were preparing for the festival at the Sormuthaian Kovil, an annual event that puts a great deal of anthropocentric pressure in the heart of the Mundanthurai plateau. It is a good time to explore the surrounding area, take in the breathtaking scenery of the Mahendragiri range and explore the Nambi Kovil temple. Like other pilgrims the kids and I enjoy bathing in a variety of cool streams and rock pools. Our visit is fleeting and we soon turn northwards to follow the monsoon back up to the Palanis. Nambi Kovil set in the Mahendragiri range of hills just north of Kanyakumari. This is a rare Vaishnavite temple with close connections to the temple at Thirukurungudi set amongst a largely Shivite population. The temple is surrounded by KMTR and located by a beautiful stretch of riparian forest at 400 meters above sea level. The impact of significant numbers of visitors to the temple illustrates the difficult task of managing religious pilgrimages in protected areas. Because the access is physically difficult the numbers of visitors are relatively low for the moment. Martinelli & George Michell. Oriental Scenery. Oriental Scenery: Two Hundred Years of India’s Artistic and Architectural Heritage. New Delhi: Timeless Book, 1998. Print. Looking east from the Kodaikanal-Beijam plateau and escarpment edge in the Palani Hills. Evening light over the growing agricultural settlement of Kavunji with the Anaimalai Hills dominating the western edge of the Palani Hills. The area around the south Indian hill station of Kodaikanal is well known for its natural beauty, salubrious climate and views over the arid plains to its south and north. In the previous post I explored some of the negative impacts of the new wave of vehicle-based tourism in places like Devil’s Kitchen. Here I share several vignettes from the hills that celebrate aspects of the landscape and ecology. These images were taken over the summer of 2011 and are composed of composite (stitched) multiple digital images. Future posts will look at conservation efforts and plans to restore some of the ecologically damaged areas. Kodai Lake and clouds clearing over Perumal from Swedish Hill. Plantation of non-native species near Nettle Shola and the golf course. Much of the upper plateau of the Palanis has been converted to similar plantations of eucalyptus, pinus and acacia species. This strand of grand trees has been in the same place since my earliest hiking experiences in the late 1970s. There is some evidence of shola regeneration under its canopy. Southern escarpment of the Palani Hills and Agamalai area viewed from the ever-popular Pillar Rocks viewpoint. Pillar Rocks is on the right. Rosneath Cottage, one of the oldest bungalows in the settlement of Kodaikanal. It was built in the mid-19th Century. Wind turbines in the Cumbum Valley with the Highwavy Hills in the background, as seen from the southern edge of the Palani Hills on a very clear, monsoon-washed morning.